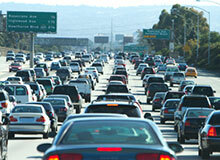 Traffic delays prompt most drivers to think about how they can circumvent the gridlock and travel more efficiently. In a working paper — titled “Speed” — Wharton real estate professor Gilles Duranton and his co-authors take these calculations to the next level. They challenge the common solution used to combat most traffic problems — increasing “supply” or the number of possible options available to get from “point A” to “point B” — and suggest that the potential for real gains instead lies in managing travel demand, an alternative that drivers often resist and politicians are wary of legislating. Traffic congestion imposes immediate and tangible costs in the form of hair-pulling frustration on the part of drivers, but it also results in substantial economic consequences. The researchers estimate that 71 million hours per year are lost due to congestion in an average metropolitan statistical area. That translates to about 34 hours per person per year. Valuing time lost at $11.50 per hour, the tab comes to $391 annually for the average person. In total, for the 100 U.S. metropolitan statistical areas studied, the loss for privately owned cars exceeds seven billion hours per year or $82 billion total, according to the researchers. The loss more than doubles when commercial traffic waiting to move goods, and other costs such as gas, are taken into consideration, the authors add. The overall cost may still seem relatively small next to massive economic issues like health care and education, Duranton notes, but he says that by comparison, traffic congestion is so simple to fix that it cries out for attention. Indeed, is any activity in the United States more pervasive than car travel? In 2008, cars, car payments, repairs and gasoline swallowed nearly one fifth of an average U.S. household budget. The average driver spends 1.2 hours per day on the road. As a nation, the U.S. spends about $200 billion annually on road construction and maintenance, nearly three times the proposed 2013 budget for the U.S. Department of Education. The authors created a database to track nearly 420,000 trips, 102,000 drivers and 71,000 households in the 100 metro areas in 2008 with comparable data for 1995 and 2002. When the numbers were crunched, two widely held beliefs fell by the wayside, the researchers say: Neither additional traffic lanes nor more widely available mass transit alleviated traffic congestion. If municipalities build more capacity, additional drivers take to the roads until congestion returns to previous levels. Urban and suburban drivers alike naturally flock to roads that are less traveled. Whereas previous research estimated that a 10% increase in road capacity in a city would spur a 3% increase in overall vehicle kilometers traveled, Duranton and his colleagues found that the figure would actually rise 10% — exactly commensurate with the capacity of the new lane space. In other words, the benefits of the new lanes are negligible. “Basically, if you double the amount of road, the speed of traffic will go up by at most 5%,” Duranton says. The researchers were also able to develop a laundry list of driving traits. For example, on average, women drive about 0.5% slower than men. For every year that drivers grow older, they decrease their traveling speed by 0.3%. Motorists with a bachelor’s degree drive about 7% faster than workers who have not completed high school. People from households with annual incomes around $60,000 drive about 9% faster than those from the poorest households. There are trace seasonal differences, too, Duranton notes. For one thing, traffic during the winter and fall months moves about 1% faster than during the spring and summer months. Road-rage afflicted drivers can also take note of a “speed index” developed by the authors to rank the 50 largest metropolitan statistical areas in the U.S. by average travel speed. Grand Rapids, Mich., and its environs clocked in as the fastest, followed by Louisville, Ky., Greensboro-Winston Salem-High Point, N.C., and Kansas City, Mo. The Miami-Fort Lauderdale metropolitan area finished last, right behind Chicago, Seattle, Portland, Ore., and Los Angeles-Orange County in California. Travelers in Miami move 28% slower than those in zippy Grand Rapids. Ranking cities by speed highlights the complexity embedded in road congestion, Duranton suggests. The distances of trips tend to skew observations about speed because the rate of travel on longer trips generally exceeds that of shorter jaunts. Duranton and his co-authors used the purpose of travel as a proxy for distance. For example, shopping outings are usually short trips, while commuting to work often takes longer. The process yields a more refined measure of speed in urban areas, taking into account that traffic congestion will induce drivers to make different choices, like going to a neighborhood store instead of a more remote shopping center. “For a city like Miami that is very slow, people will take very short trips that will make them look even slower,” Duranton notes. All things considered, speed differences across cities are less than what the raw data implies, he adds. “Miami, which [at first glance appears to be] 50% slower than your average Midwestern city, in reality is only about 30% slower,” Duranton points out. Therein lies the rub: “If you manage to make Miami faster by providing faster roads and better traffic technology, people will drive more,” thus nullifying some of the intended benefits. If not more roads and mass transit, what solutions can ease traffic congestion in a meaningful way with net economic benefit? Ample evidence points to solutions likely to be very unpopular with motorists, the researchers say. Among those options: Congestion taxes or surcharges for highly traveled roads or during peak times of the day. Cities including London, Stockholm and Singapore have already successfully instituted such policies. New York mayor Michael Bloomberg unsuccessfully proposed a fee on vehicles traveling to or within Manhattan. Executed well, it’s a win for nearly all concerned, he adds. “One thing we know is that congestion pricing works. If you impose a price for drivers to drive on a road, they will react to that.” When city officials in London pioneered the practice, improvement became visible on day one. “The speed of traffic went up by a factor of two and bus delays fell by 95%,” he notes. London adopted an unwieldy license recognition monitoring system that has squandered opportunity for financial gain, Duranton says, but alternatives from transponders to GPS tracking could slash costs in addition to travel time for cities looking to implement such a policy. According to Duranton, the failure to adopt congestion pricing in New York was a huge setback. “Had New York managed to go ahead, all major cities in America could have followed.” He says that politicians in New York and elsewhere fail to appreciate that a congestion tax imposes less burden than implicit taxes levied on cars sitting in traffic wasting time and fuel — and spewing greenhouse gases.